Here’s the Complete List of Record Store Day Releases for 2013!!! Record Store Day is coming up April 21st and looks to be insane. We scored an early product list for Record Store Day detailing every release on April 21st including how rare each release is and prices. There will be tons of limited releases, new releases,and classic records sold throughout the entire day. A few releases include: Phish, Notorious BIG, Bob Dylan, Captain Beefheart, the soundtracks for ‘Poltergeist’ and ‘Dazed and Confused’, ‘Aerosmith’, David Bowie, The White Stripes, Frank Zappa, and Roky Erickson. It’s going to be amazing. 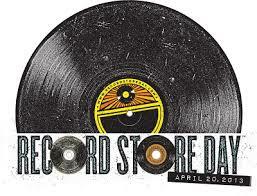 Click the link below to start planning your Record Store Day purchases! This entry was posted on Wednesday, March 13th, 2013 at 12:34 pm	and is filed under Events, Music, News. You can follow any responses to this entry through the RSS 2.0 feed. You can skip to the end and leave a response. Pinging is currently not allowed.